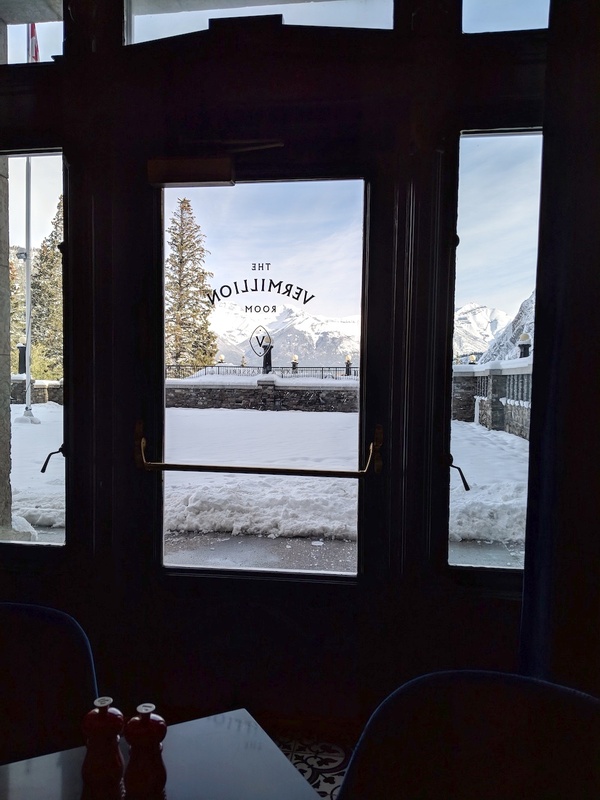 The Vermillion Room Bar and Brasserie in the Fairmont Banff Springs Hotel is the latest restaurant iteration in this space overlooking the Bow Valley. At one time, it was the formal Rob Roy dining room – jacket required. Later still, it was the much more casual, and more family-friendly Bow Valley Grill. 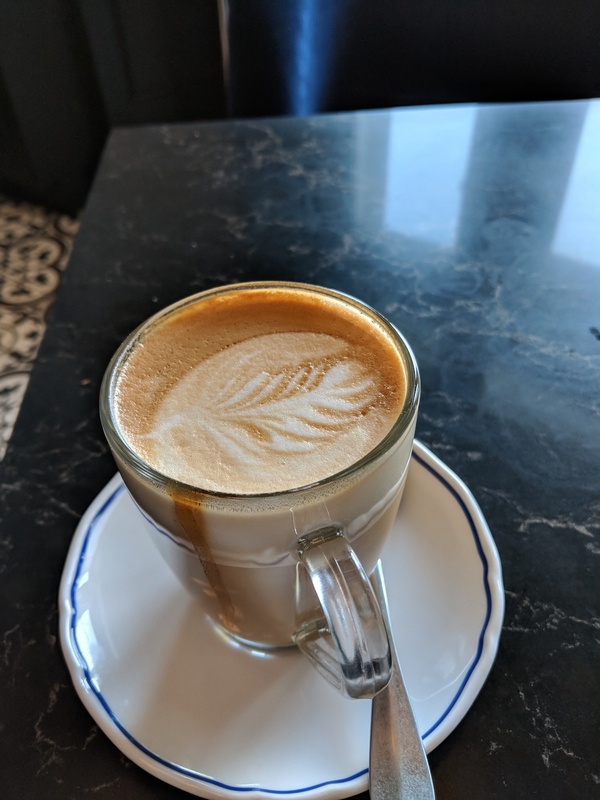 It’s possible I may be missing a ‘version’ or two, but its current form as The Vermillion Room, it’s a stylish space with an appealing French brasserie menu. I found it brighter, hipper and more vibrant than the Bow Valley Grill – art deco light fixtures and gleaming brass will do that, I suppose. And in my opinion, the new brightened-up design takes better advantage of the stunning mountain view than the interiors of the former restaurants. 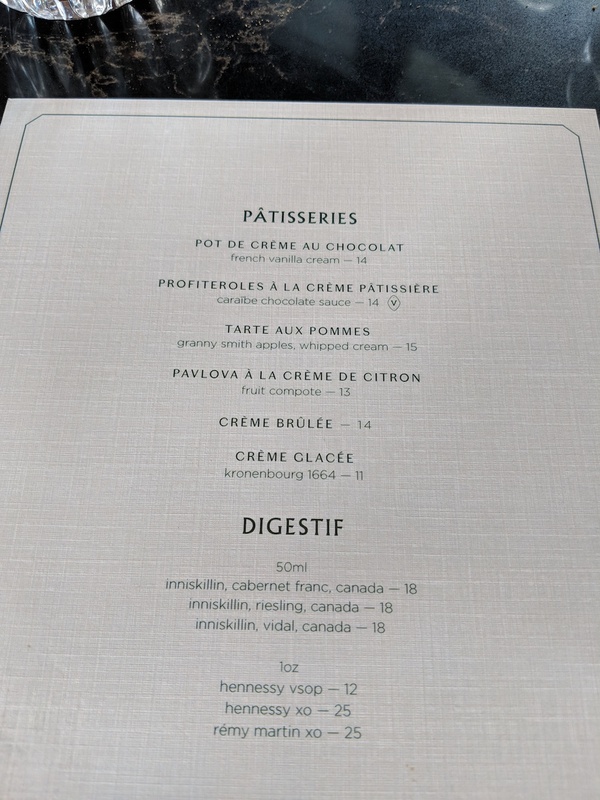 The lunch menu had a nice variety of selections, with familiar French-comfort-cuisine inspired favourites such as the Croque Monsieur, Steak Frites, Roast Chicken, and Soupe a L’Oignon. Prices are on the higher side for a (fairly) casual lunch, but we found the quality of our meals to be quite good. 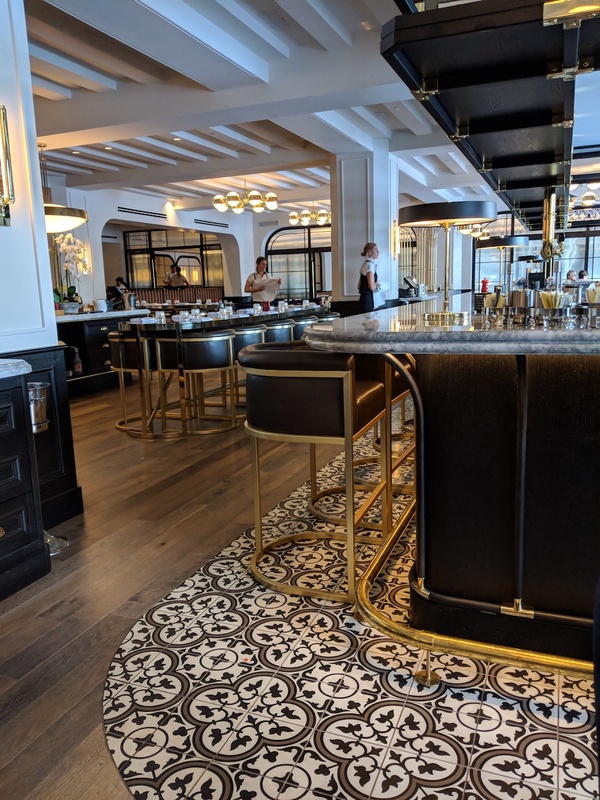 (I’m not sure this restaurant would in fact be described as casual – but it certainly is more so as compared to the 1888 Chop House in the hotel, incidentally not a lunch option). 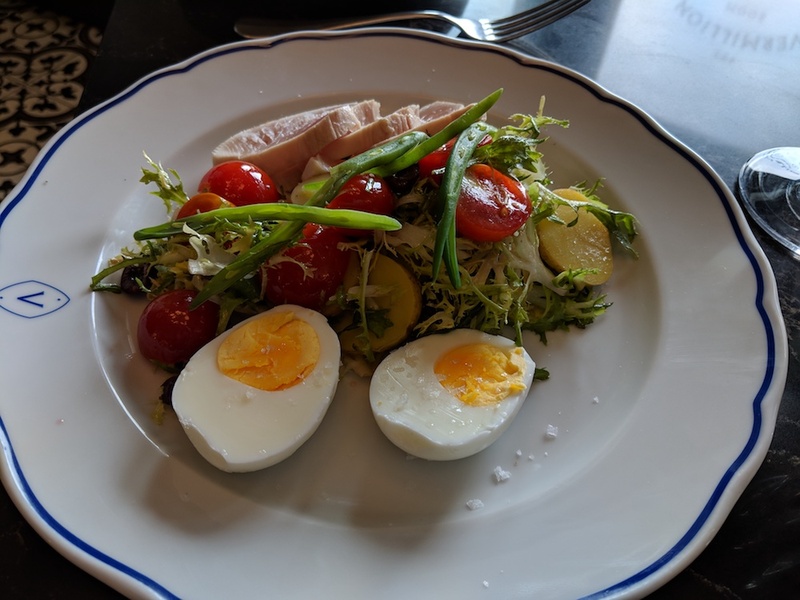 I had the Salade Nicoise and was very pleased with both the quality of the tuna, and the perfect way it was prepared – rare and just barely warm. The Mans Farm egg was fresh and very tasty, and the fruity olive oil dressing was delicate, slightly warm, and tied the delicate greens and vegetables together with the fish. I paired it with a glass of sweet and lovely Alsatian Pinot Gris. 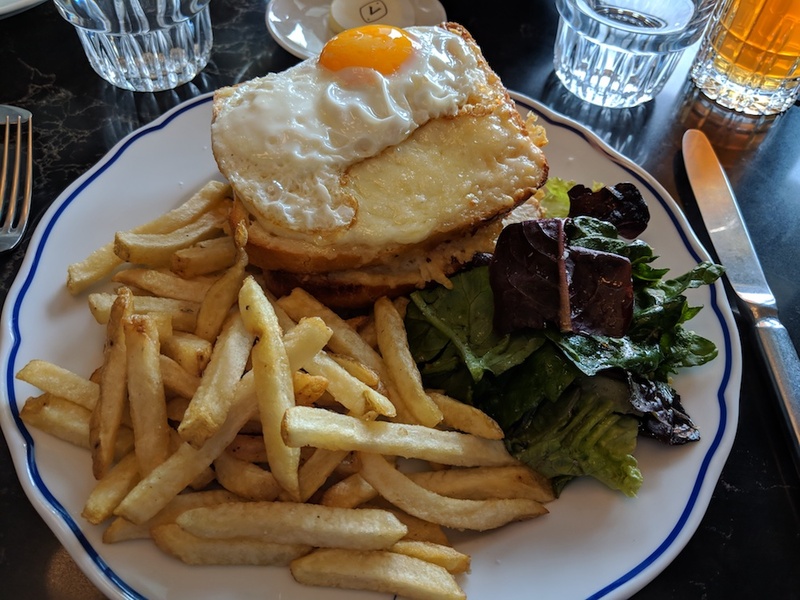 For my Monsieur, the Croque Monsieur of course – topped with a beautiful fried egg (ingenious). The sandwich was rich, hearty and good – but the fries may have been the meal’s standout feature. Prepared with a delicate truffle oil, I found myself leaning toward his plate just to catch a whiff of the earthy aroma. Hold the ketchup, please. 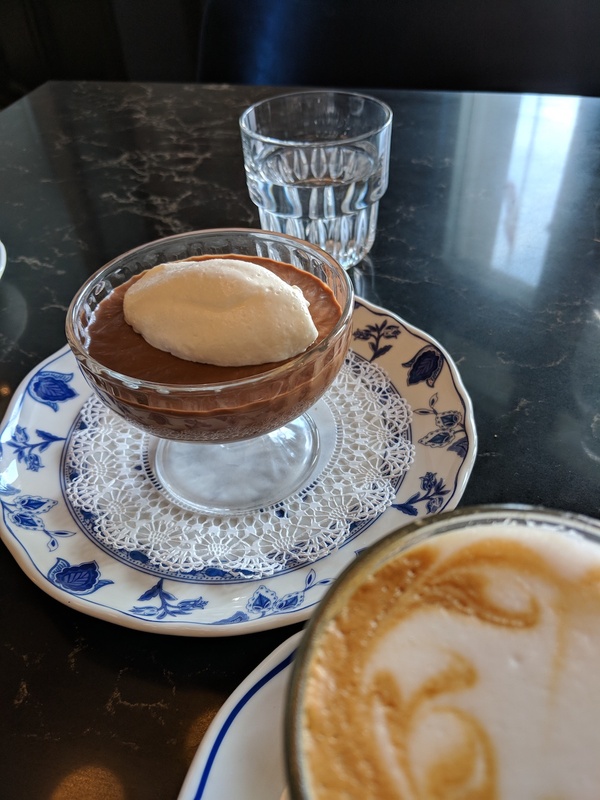 For dessert – we had the Pot de Creme au Chocololat with French Vanilla Cream and a couple of very good cappuccinos. 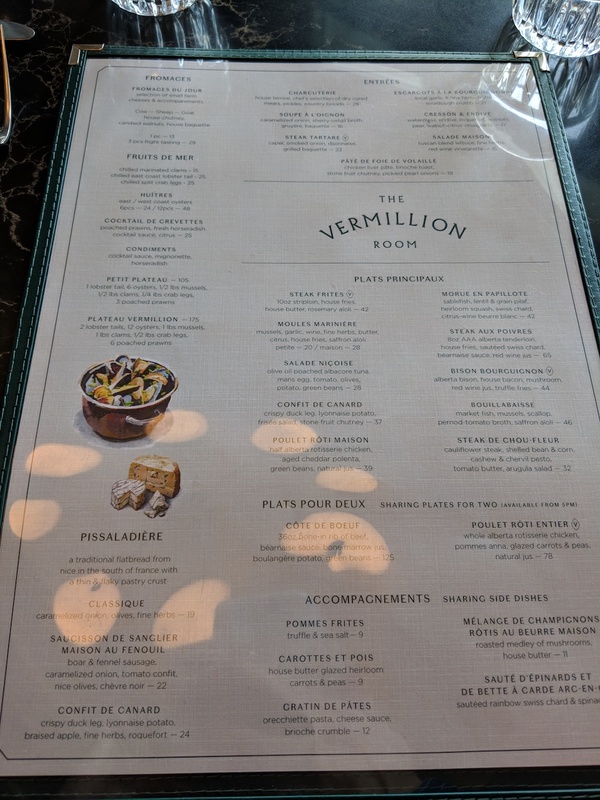 Our experience at the Vermillion Room overall was relaxing and leisurely, with tasty food – a fine way to spend a Thursday afternoon. The dining room was fairy empty at this time of day (noting also of course the time of year – early October), and service was a tad on the slow side. It didn’t bother us as we had nowhere to go, but something perhaps to keep in mind if you have a tight itinerary. Also, note that the while restaurant is open for breakfast, lunch and dinner there are closures in between these meals (Breakfast: 7am-11am; Lunch: Noon-3pm; Dinner 5pm-10pm and Weekend Brunch 11am-3pm). 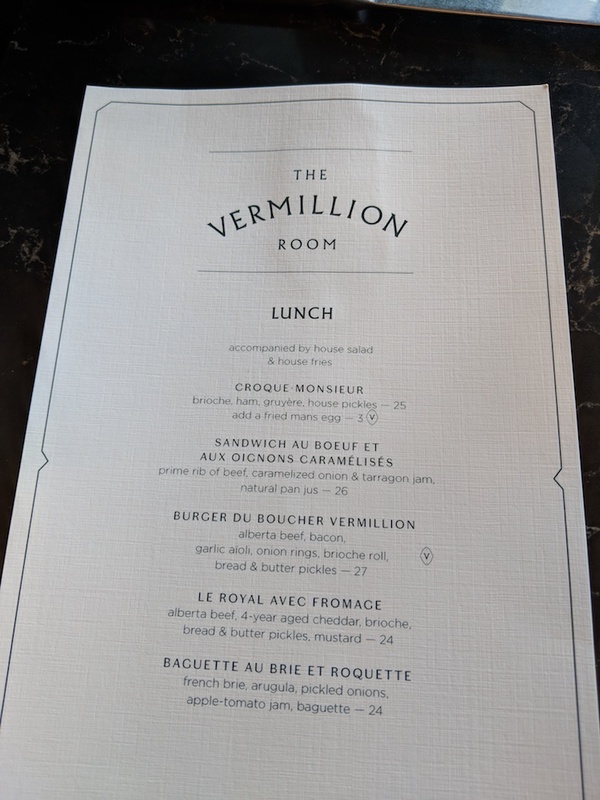 The only meal we had at The Vermillion Room was one very laid back and lazy lunch, so I can’t comment on either breakfast or dinner. My impression is that with its spaciousness and stylish-yet-casual atmosphere, it would be a popular choice for hotel guests for these meals – probably fairly busy and boisterous. An enjoyable atmosphere – and you can’t beat the view.